Most of us have heard the phrase “If it sounds too good to be true, it probably is”. It’s so obvious, yet in our experience when it comes to assessing investment opportunities this is often something that seems to go out of the window. It will often get trumped by our ancient hardwired emotions: fear and greed. The unfortunate case of London Capital and Finance investors is a topical case in point. Thousands of people committed £236m to their ‘Fixed Rate ISA’ product, tempted in by a hugely successful marketing campaign promising interest rates of up to 8%. The products failed catastrophically, leaving investors now scrabbling to recover what remains of their initial outlay from the wreckage of the product failure and also LC&F entering administration. Many were ‘first time investors’ and stand to lose 80% of their initial investment. Others admit to committing their life savings and now face an uncertain future as a result. Interest rates remain at historically low levels hovering around 1% - 2% for cash deposits. Just how is it that a product can offer you 8% and be playing the same game? The truth is that they weren’t, but more importantly, could never have been when you understand the core principles of investing. 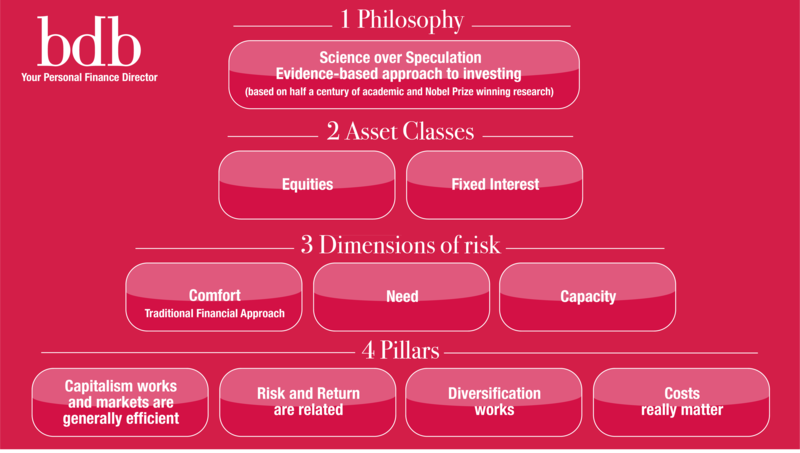 One of our four pillars of investing is the belief that risk and return are related, regardless of what the marketing literature (or anything or anyone else for that matter) says. This is just one of the lenses used on bdb’s investment committee’s microscope when we view any prospective investment for our clients. It is easy to see how a first time or even an experienced investor might have been lured in given the long term paucity of attractive alternatives. Many who stand to lose were misled and have our utmost sympathy. We wish them well in their pursuit of reparations. However there are some fundamental laws of the universe you cannot escape, the risk and return relationship is one.